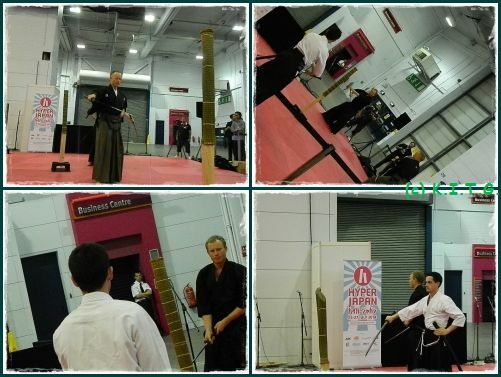 Hello and welcome to our final part to our Hyper Japan 2014 coverage , sorry this has taken longer to be finalised then the previous installments. But better late then never I say, and this is really the icing on the cake to so to speak. 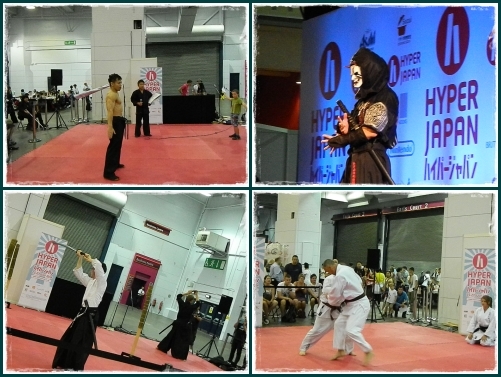 Since it's inception Hyper Japan has improved it's martial arts content with each show. 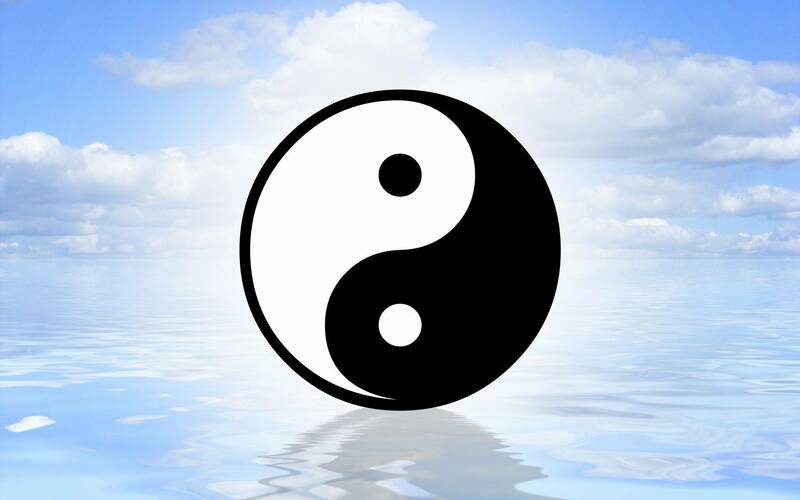 Along with many other aspects ,probably due to the larger the show gets ,the more can be accommodated. 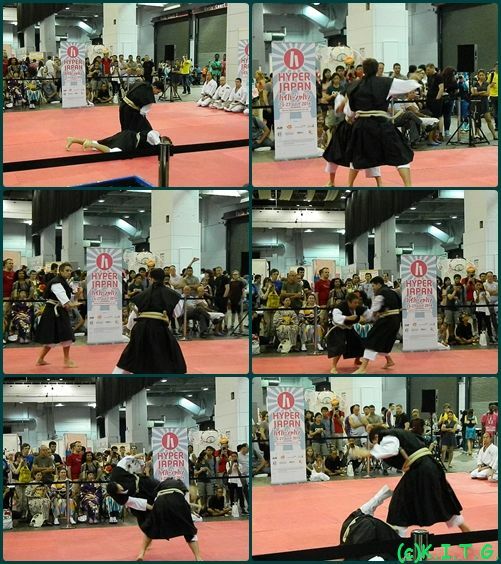 Now I say martial arts , this feature also focuses a bit on the stage show elements as well as the demonstrations by actual Martial arts clubs. 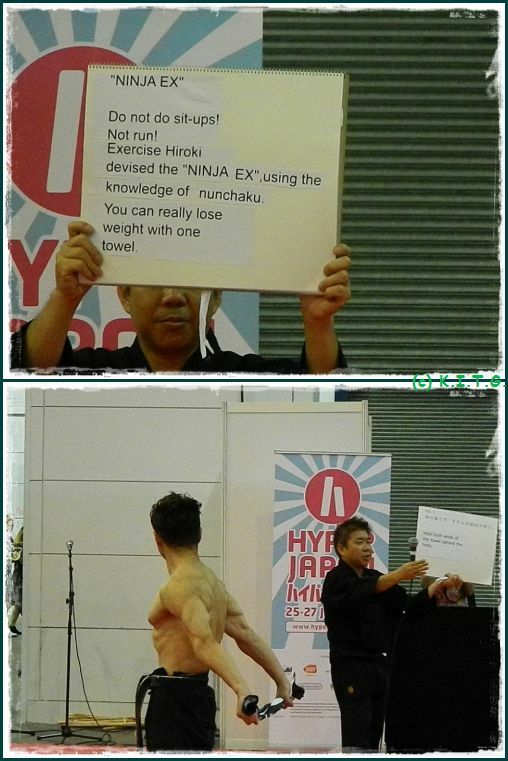 This powerhouse of a man who has studied Ninjitsu to extreme is a amazement to watch , Hiroki had daily stage shows at Hyper Japan plus a series of short seminars where he taught any body willing the art of exercise ,Nunchaku style by use of a simple towel. 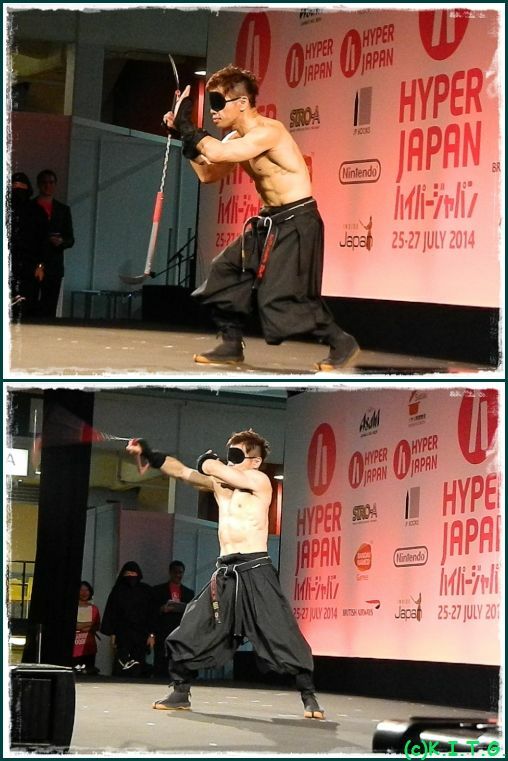 Hiroki's stage show was a amazing feat of Ninja sword stealth , rolling and Nunchaku swinging madness. But the real treat was the use of a double sickle bounded by chain (Kama) which he swung around at break neck speed , and to top that Blind folded as well. 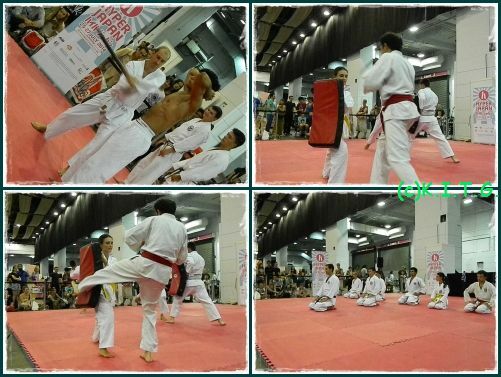 Trained from early childhood Hiroki has for the past twenty five years devised his own style of Mukei Mugen-Ryu which is from more then thirty years of training. Hiroki has appeared in shows and television all around the world from East to West, including appearing on Stan Lee's 'Superhumans' and is revered by by Stan Lee himself. 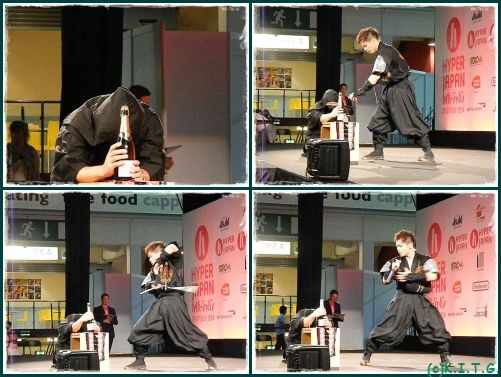 Hiroki's Ninja Ex exercise program is proven to help you maintain your weight with the use of Nunchaku movements all with the aid of a towel so that there is no risk of injury. 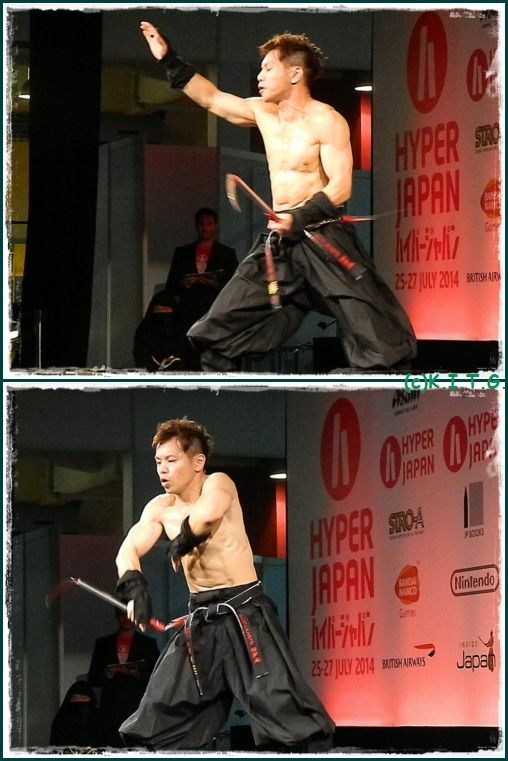 We actually caught Hiroki's stage show a couple of times at Hyper Japan and he even posed for pictures after one of them ,showing more technique. His Ninja Ex routine was a good idea for the show ,as anyone could take part without worrying about over exertion and it was only like fifteen minutes long . 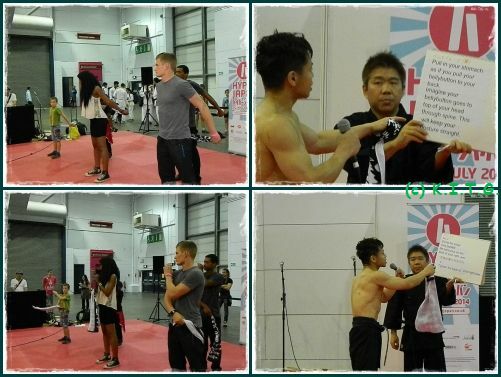 My advise is if you have the chance to see Hiroki perform then make sure you do, because he really is a living Ninja..
Of course their where other arts demoing on the Martial arts stage , Friday saw the appearance of a Karate demo team ,their routine consisted more of feats of strength or conditioning though ,with one guy laying on the ground while others walked over him, then the same guy got punched in the stomach repeatedly .. They did some technique with some kicking on kick pads. It was OK ,but maybe not as entertaining as some of the other demos over the weekend. 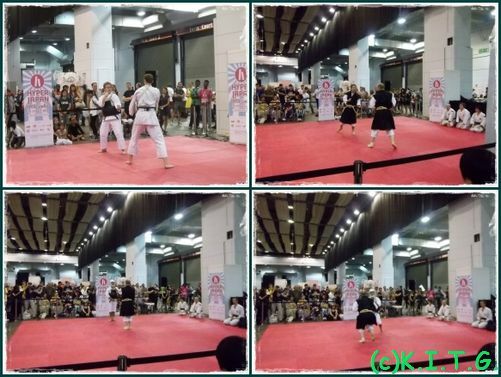 Saturday saw a few different arts on show with Jujitsu ,Shorinji Kempo ,Kendo and others ,of course we did not get to see them all as we allotted time to different events. 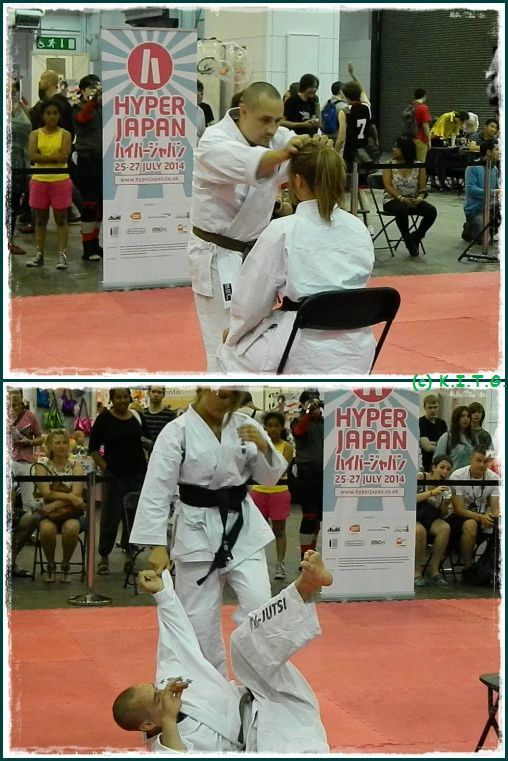 The Jujitsu demo was a good array of technique, from break falling , throws and defence against various styles of attack. The defence from being attacked while sitting was a good showcase as was the senior instructors demo of how to deal with a hoody wearing thug , where the thugs hood becomes his downfall. Technique was quick and not overly flashy but a good prime example of how to get the upper hand. Really enjoyed this demo. Our next art was the return of the British Shorinji Kempo Federation, these guys put on a good show last year and even though they where minus their chief instructor Tameo Mizuno this year . But like last year they showcased a vibrant display of martial arts from their stable, with Multiple attacks on to one person ,Contact sparring for demo purposes, so no one was taken to hospital. Again the BSKF put on another good show and it was good to see them perform again. 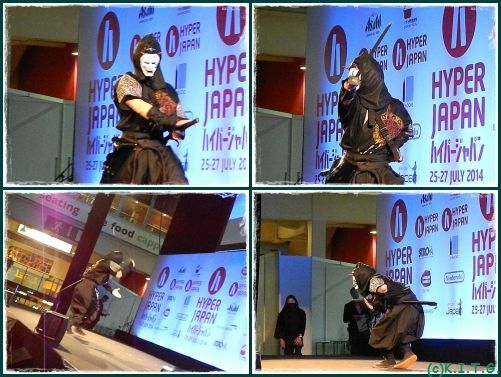 The Iaido sword-masters returned from last year as well, their demo was pretty much the same but you have to give to them for the concentration in performing with live blades and demonstrating how easy it is to decapitate someone with their deadly but beautiful weapons. 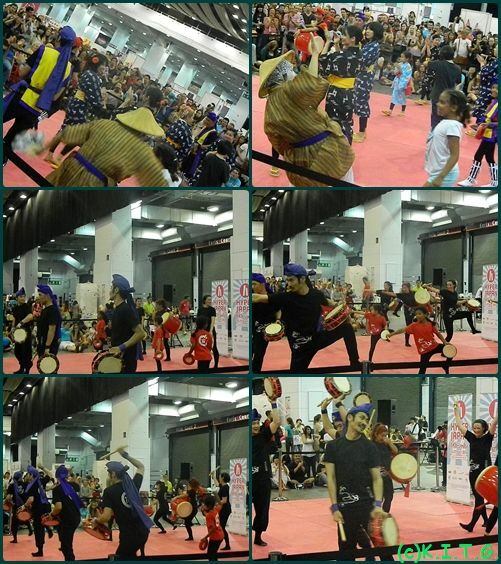 On a milder note the London Okinawa Sanshinkai gave a great display of Music and Dance on the Sunday at Hyper Japan, encompassing traditional Japanese folk music ,combined with Japanese drums and all put together in a vibrant colourful performance of dance . The training for these Guys and Girls must be as intense as some actual martial arts performance as the regime and precision to everything is as precise as any martial art. They deserve their place on this Martial arts page special with no reservations. Impressed we where. 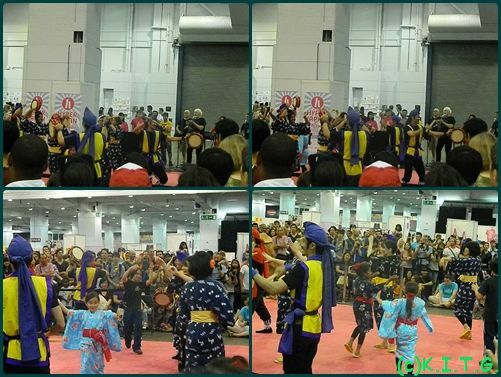 So that's it our final coverage of the Hyper Japan 2014 show. We look forward to see what Hyper Japan has in store for us at the Christmas Hyper Japan Market.. Thanks again to Hyper Japan and Spreckley Partners for our press passes and we look forward to seeing everyone at the Christmas event. 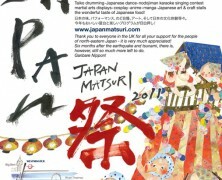 And don't forget to check out our other sections on this Hyper Japan show, links below.